There is no bear in this soup. Nor is the soup named after any bear. In fact, there are zero bears to be found in the state of Chihuahua, where this soup comes from. Yet, I admit Pepe was right, it is a spectacular soup, and it is called caldo de oso (or bear soup). I met Pepe a few months ago at a Telemundo news interview, while on book tour in Denver. He was the producer. As he walked me out of the building, we got caught up in a long, detailed conversation about soup, even though I was in a hurry to catch a plane. I don’t know what hooked me more in wanting to know every little thing about this soup: its curious name, how much he seemed to adore it, or the fact that I’ve never tried it although I’ve been to Chihuahua many times. Well, here we go again. Another story, out of hundreds and hundreds of incredible stories and recipes I have learned while traveling the US. It turns out, each and every single Mexican I have met here is as passionate as I am about the Mexican food we grew up with. We are all a bunch of nostalgic food fanatics. It turns out caldo de oso is insanely popular in Chihuahua. The thing is, it is not to be found in restaurants, but in homes. One reason I may have missed it all the times I visited. And considering how dearly loved it is, it makes the origin of its name even funnier. Almost a century ago, workers building the La Boquilla Dam, on the Conchos River in Camargo, used to make a fish soup every day with catfish, which were bountiful in that river. After eating it so often, instead of calling it caldo de pescado (or fish soup), they started calling it caldo odioso, which translates to hateful soup. 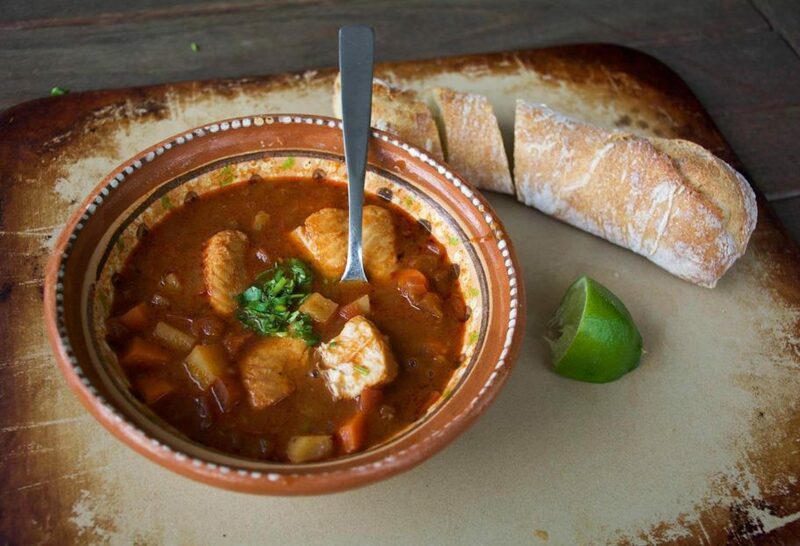 From saying caldo odioso again and again, the soup got the nickname caldo de oso – from the shortened odi-oso to oso. It is a common Mexican practice to make words smaller and use them in their diminutives or cute nicknames. And the name stuck: caldo de oso! However, other than the workers at the dam who ate it everyday, people in Chihuahua absolutely adore this soup. So, Pepe gave me some tips, and he told me in detail how his mom makes it. I thoroughly researched it and tested it in my kitchen. And let me tell you, caldo de oso is totally worth the heavy nostalgia for it that Pepe carries around. Place the ancho chiles in a bowl, cover with 2 cups boiling water, and let them sit for 10 minutes until they plump up and rehydrate. In a soup pot, heat the butter and oil over medium heat. Once the butter is melted and bubbly, add the onion and cook for 4 to 5 minutes, until softened and the edges begin to brown. Add the garlic, stir and cook for a minute until fragrant. Increase the heat to medium-high and incorporate the chopped tomato, cook for 6 to 7 minutes, until softened. Sprinkle the flour on top of the cooking vegetables, stir well, and let cook for another minute or so, stirring frequently, until the flour starts to brown and smell toasty. Pour in the broth or water and bring to a simmer. Meanwhile, place the ancho chiles along with a cup of their soaking water into a blender, and puree until completely smooth. Add the chile puree, along with the thyme, marjoram, oregano, cumin, bay leaf, salt, pepper, pickled jalapeño and its vinegar to the soup, and mix well. Once it returns to a simmer, reduce the heat to medium, and let it cook for 15 minutes with the lid ajar. Add the carrots, potatoes, and fish pieces and continue to cook for 10 more minutes, until vegetables and fish are completely cooked through. Serve hot, along with lime wedges and chopped cilantro for people to add to their taste. I like it with crusty bread, such as a baguette, on the side. Oh I love a good soup too, Lena! Say hi to your mom for me. Oh enjoy the fresh catch, Irma! Oh that’s awesome! I hope you both enjoy the soup. I travel to Chihuahua all the time and have many very close friends here in Arizona from Chihuahua. I have stayed and visited their families for over 15 years and over 20 times in the period. I never have heard anyone talk about this soup. That is until I start asking if they know of it, and of course they all have. It was like a secret they where keeping from me. Oh, Chihuahua, you are like an onion. I keep peeling and I discover new layers! I found this recipe while looking for a good Caldo De Res or Mexican beef soup recipe. My mother learned how to make it from her mother but she no longer cooks and does not remember the recipe. The closest I found to hers comes from Los Galanes restaurant in Mexican Village Detroit but I did not ask for their recipe. Pati what seasonings do you think I need to get the flavor right, maybe just some chillies? I made this last night and it was delicious, light but filling. I live in the southern US and fresh catfish is readily available, so I’ll be making this again soon. Thanks, Pati! Also, I pray that your loved ones in Mexico City are alright after the disastrous earthquakes there in the past week. My heart goes out to all the victims. So happy you liked the soup! And thank you for your message…thankfully my family is ok. Sounds awesome. Will surely have to try this soup. I always love a good soup. Especially if it is authentic. Hope you love it Julia! Ana that’s amazing! I hope it brings back wonderful memories and that you love it. Si, muy buenas memorias de la infancia… ? Me encanta tu TV show, cuando me mude a USA hace 5 anios lo descubri y me encanta, lo disfruto, y me hace sentir cerca de Mexico ??? Gracias por tu mensaje tan lindo…significa mucho para mí. My wife is out skinning the bear i bagged last evening. Now that i have read the complete history and all of the ingredients how am i going to tell her i have to go fishing tonight for “catfish?” She makes me clean the catfish. Maybe we will make two versions. I am so in trouble. This sounds sooo delicious, I’m going to have to make it. Thanks Pati!!!? Yay! Let me know how it goes Chava. I did it! Y me encantó! ? You are my inspiration, I love all of your recipes and I love your tv show. Out of all of the Chefs on create TV you are special because you have such a warm sweet personality, and you seem so kind. My husband is from Hidalgo, Mex. and I am Italian, so since I began watching your show I’ve learned so much about the culture and have fallen in love with cooking Mexican cuisine. Ivanna…this is so sweet and kind. Thank you so much! Thank you Pati for the recipe for this soup. I love making soups and having them when we want a light dinner!!! I also like the stories that you tell with the recipes that you post. By adding the carrots and potatoes along with the fish, I would think that the fish would be overdone and the carrots and potatoes would be undercooked. It seems giving them a 5 minute head start would be better. No? You and your show are a wonder filled event! Many thanks for the inspiration from which I draw many a delicious meal. Between you and Rick Bayless, I have a very well stocked Mexican kitchen (e.g. epazote. Mexican oregano and many dried chilies etc.) which is saying a lot from first born German girl! Thank you, Pati! This is the perfect recipe for lent! I am looking forward to trying it. Hope you enjoy it Celia! Never heard of it until today. Thank you for the history and the recepie, It looks delicious! I can wait to make it. Hi Patti, we love you!! Can I substitute salmon for the catfish? Hola Gina, I recommend substituting the catfish for any firm white fish, but you are welcome to try with salmon! I grew up knowing that pulque was another caldo de Osos !!! My mom makes this I’m pretty sure. Voy a hacer esta sopa, se ve sabrosa y facil. Gracias Pati por compartir la historia de la sopa de oso, jijiji. Yo soy de chihuahua y lo conosco un poco diferente. Es con pescado descarnado (dsmenuzado) pero igual en salsa de chile ancho y si ay algunos restaurantes trdicionales que venden este platillo. Y ortos tradi cionales como el caldo abijio que es con carne seca. Saludos paty. Hi Pati! Love your show. I live in Sydney and access to all the lovely chillies you use in your cooking is so limited. If I wanted to make this dish, what would you recommend as a good substitute for the ancho chillies? I can get jalapeño but that’s about it 🙂 love your show and your work! Love your show and your books. It’s always a pleasure to tune in. Lewis thank you so much for watching the show and reading the books…it means a lot. I love your show Patti its one of my favorites. I have learned so many things from watching. I am so happy you are learning Diane…that means a lot. Suena muy sabroso y como tengo pescado fresco y esta haciendo frio, es una magnifica idea para que haga esta sopa de oso hoy. Mig racias por la receta. this doesn’t have to do with the soup, but I love it when your son’s cook with you. You have a truly beautiful family. Thanks for all the cooking shows ! Aww thank you so much Joan. Thank you so much Patti !!! I love your show !!! Thank you Robbi for tuning in! There is a similar soup made in Sicily mainly in coastal towns each with their own little variation but the main ingredient is always Spada, Swordfish. The spices and vegetables are much the same except they would use fennel instead of cilantro and mild to hot red pepperoncini flakes in place of Jalipenos, or in some towns they would simply add a couple tablespoons of giardineria with it’s juice. I am going to try your soup ASAP. My mouth waters just reading the recipe. Muchas Gracias. Fascinating! Thank you for sharing Miguel. This soup sounds delicious. I will be trying it soon! Yay! Martha I hope you enjoy it. Can you use another type of fish for this recipe? Yes Marie you can use whichever firm white fish is your favorite. Hi Pati, can you make this with any other type of fish to get that same flavour? Catfish is not available to purchase here in Canada. Hi Judy, you can use red snapper, halibut, swordfish, shrimp….or any firm white fish. Thank you Pati! By the way, we love your show! I want to try this recipe Patty. It sounds good. Since I’m s lover of fish and other seafood nothing can go wrong with fish. but its true my last name is Fish. Carmelita I’m laughing so much…what a perfect last name…love it! This recipe has a lot of the same ingredients as one of the versions of sopa de mariscos that we used to get at a restaurant called El Torito when we lived on the Texas/Tamaulipas border (in Brownsville), 1999-2002 — minus the shrimp, of course: the potatoes and carrots, the tomatoes, the flour for thickening, etc. Can’t wait to try it! Lori, I hope you love it! En vez de usar catfish, se puede usar halibut o posiblemente red snapper? Thank you so much Argelia! Can’t wait to try this – sounds heavenly! Will update with results! Thanks Pati! I look forward to your update Candice…hope you love it. If no catfish available is there a close second choice you would recommend? Hola Israel, you can try any firm white fish or even shrimp.